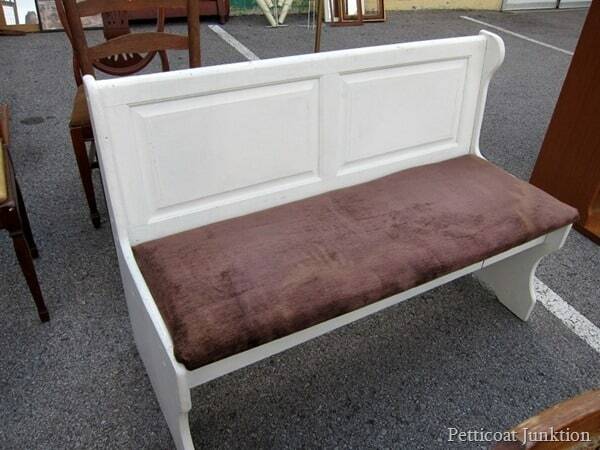 The white farmhouse bench is a beauty now but she didn’t start out that way. The makeover was a bear. Did you guys miss me yesterday? I sure hope so. I just couldn’t get it together for a post. I’ve been stressed out the past few weeks over a Power Point Presentation I had to do for my Senior Seminar class. I hate public speaking. I think I shared that little tidbit with you before. Anyway, the presentation was yesterday and I was busy with last minute details. Now I’m breathing a sigh of relief because it’s over! Only 6 more weeks till graduation. Woohoo. Today is themed furniture makeover day and the theme is “Farmhouse”. I love farmhouse style. My home isn’t decorated in the farmhouse style which to me definitely leans toward white walls and white décor. I love color too much. Do you ever wish you could have two houses so you could decorate them differently. I know, crazy, right! I can’t even keep one house decorated. I found the bench at the Nashville Flea Market last July. Sometimes it surprises me how long a piece of furniture has been in the workshop. I think I may have paid between $30-$40 for it but not sure. The makeover gave me fits. I first recovered the seat and that didn’t work. Then I pulled all the fabric and the padding off the wood seat and what came next was a total surprise. I don’t have all the photos together so you get to see the makeover details with a lot of photos next week. I couldn’t resist distressing the paint. And the stencil….what do you think? I added the “Sit”, then it needed something else. Something on the opposite side to balance the look. That’s why there is just a wee little branch there in the corner. I like it! I stencil because I can’t freehand paint anything. The fabric was for a bench cushion I never got made. I’m not much for sewing plus do you know how much foam costs!! To stage for the photos shoot I used a pillow that usually resides on our living room couch. I bought it at Tuesday Morning at a great clearance price last year. The suitcase is a treasure I found last week and haven’t had a chance to “revive”. Not sure what I’m going to do with the case. That’s it for me. 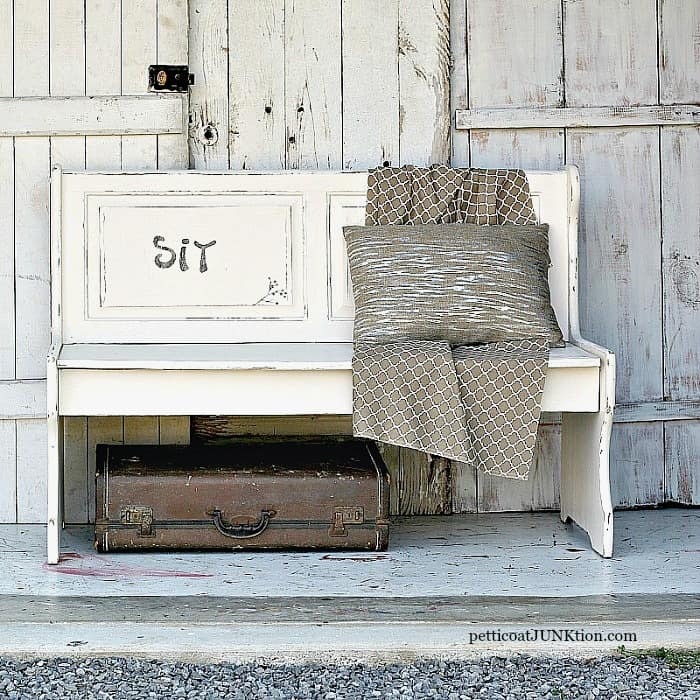 Let me know what you think of my white distressed farmhouse bench….painted with Beyond Paint. Time to see what my buddies have for us. I’ll be taking the tour with you. I need a little inspiration for a chest of drawers I bought last week. Click those photos below to see the complete projects. Have a great weekend! Kathy, wow, your bench is amazing! What a transformation! I love the distressed look and how you styled it! Please come over to our very first “Sweet Inspiration” Link Party to share this!!! Kathy! I absolutely adore this piece!! Thanks for sharing it with us at Work it Wednesday- we are featuring you tomorrow!! Your bench looks great – the little branch is perfect! I LOVE checking out all the amazing furniture transformations you ladies create every month!! I love the bench and how it’s distressed. I think it’s just perfect without the cushion. Love it how it is. How inviting is this piece! It turned out beautiful and your styling is so pretty! I hope you have a great day! This is one of my favorites! I also want to have two differently decorated homes. Most of my house feels like being wrapped in the warm glow of a fireplace…rich warm colors. 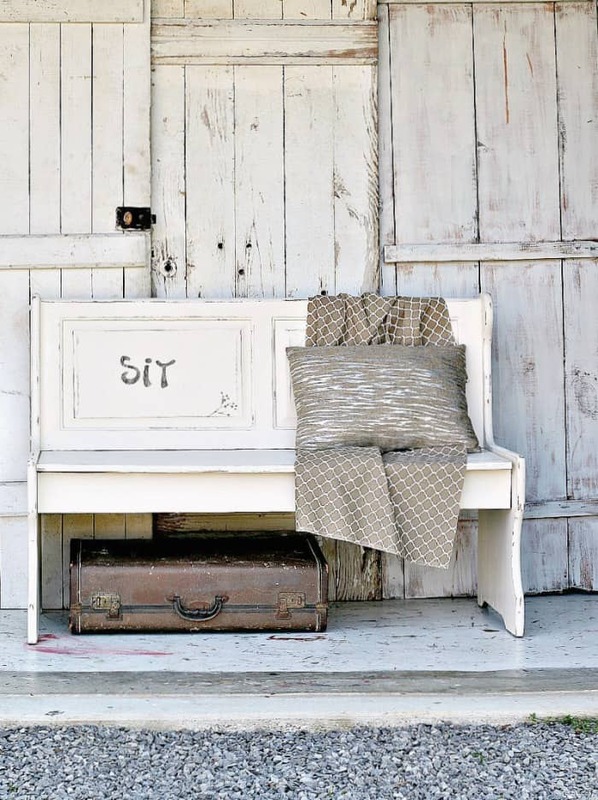 I crave to switch over to a shade of whites and creams in distressed hues. Alas, the best I can do now is at least have my bathroom all neutral. The T on SIT looks like a Y… I think a more romantic, script font would have worked better. Good luck! Kathy, I love the details that you added to the bench. I agree with the comment above, so glad you took off the cushion – now a perfect place to sit! Happy Easter! This may have given you fits but, now you have a bench to sit. Sorry! I could not resist. Your attention to detail on the furniture you give a new life to is incredible. I love the added brand detail in the corners. As is it would be a great bench near a door to take your shoes off as you enter your home. I am extremely proud that you will be graduating in 6 weeks. Maybe we will have to celebrate this summer with that trip to the Flea Market? This great bones! I love the sit verbiage too! I know what you mean about two houses to decorate…I think that is my dream!!!! Good luck with your last few weeks of school! Headed to the Nashville FM tomorrow!! If you see two chicks walking around in our “friends don’t let friends junk alone” tshirts one of them is me!! Lol. Love your blog! hahahaha! I think we are going tomorrow. Will keep an eye out for you crazy girls 🙂 Thanks for the kind comment! Love the new look. I was reminded of the saying…”Sometimes I sits and thinks and sometimes I just sits.” LOL… It turned out great. The color and the distressing with the stencil. It all works!! Love the bench! Looks great! I would like to have a “sit!” I would also like to decorate two houses…just not pay for two houses! I’m a sucker for church pews and this reminds me of one. Removing the cushion was a perfect call…it looks much better without it! I love what you did with this bench, Kathy! Now it has loads and loads of character and the cute stencil and branch are icing on the cake. I think it looks perfect just the way it is without an upholstered seat. Now you’ve got to tell me more about that fabulous backdrop – I haven’t seen this on your blog before. Pretty bench and I definitely like it without the cushion. I like the old doors that you use for pictures. I really struggle with finding spots for taking pictures of completed furniture projects. You have a good solution. I love your bench!! I like it so much better without the cushion and the distressing/stenciling you did compliments it perfectly. I like the distressed finish, Kathy. I like the little branch especially. I want a cushion on the seat……………. Was the back originally a shutter or a part of a door? Looks like it could be a shutter – which may now lead to projects for old shutters!!! Really cute bench, Kathy. It looks much better without the cushion. 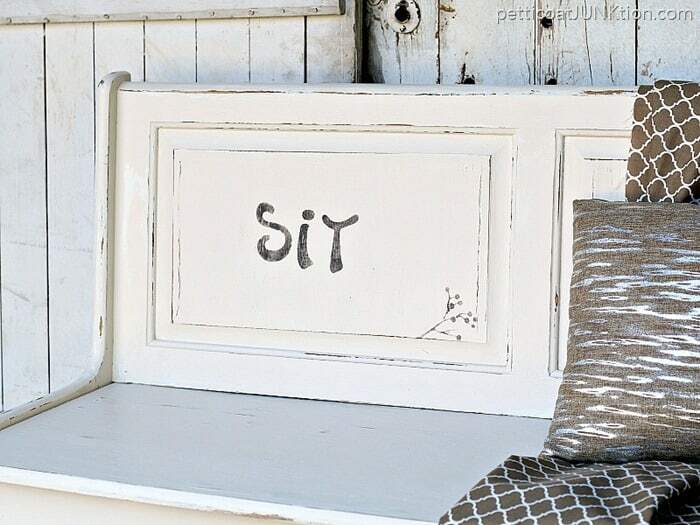 I really like this bench distressed. 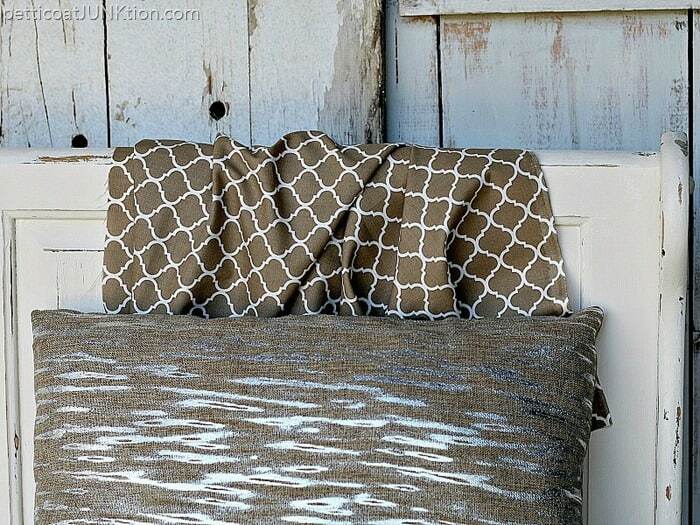 I would cover a bench pad with the fabric that you have laying over the bench and add the pillow at the end. I love what you did with this bench. It doesn’t look like the same piece! I also love the door backdrop!!!! How did you make it??? It is somewhere in your home? I am trying to come up with a backdrop idea that I don’t have to move all the time. Those doors are amazing!!!! Thank you Lindsay! Those are 3 individual doors. I found them in my junkin’ travels. I keep them for staging. The doors are very heavy! This is the set-up in this photo–The photo was taken in my workshop at the end with the garage door open. The doors are leaning against other furniture in the workshop. They are facing outside at the entrance of the garage. I haul those doors out and set them up when I get ready to take photos. It’s a lot of work!! I need something easier. Love this classic piece, Kathy, and the whimsy that you added to it. Love me some farmhouse style!